It is generally accepted that the Lancashire Heeler, which originated in Great Britain, is descended from a cross between the Welsh Corgi and a small black and tan terrier type dog. 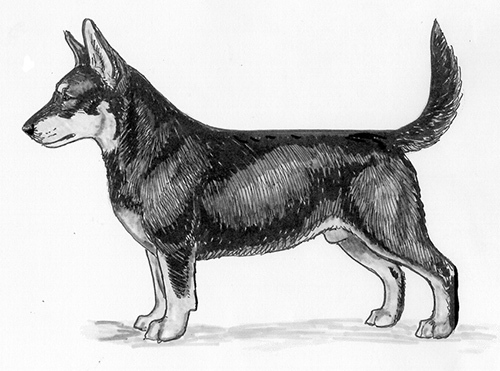 They were used as a general purpose farm dog, useful for both cattle driving and ratting. Due mainly to the interest and record-keeping of a breeder named Gwen Macintosh, the breed was recognized by The Kennel Club in 1981. Their popularity has spread to a number of other countries, including the U.S. The Lancashire Heeler was recognized by the United Kennel Club November 1, 2009. A small but sturdy, powerful and energetic working dog, either black and tan or liver and tan, with a weather resistant double coat and a natural tail that is carried in a slight curve. Courageous, happy and affectionate, the Lancashire Heeler is very alert and, due to its heritage, has instincts to work as a cattle drover and also as a hunter of rabbits and rats. The size of the head should be in proportion to the size of the body. The skull is flat and wide between the ears, tapering in width towards the eyes. There is a moderate stop halfway between the nose and the occiput. The muzzle tapers in width from the eyes to the nose. The lips fit closely. The toplines of the skull and muzzle lie in parallel planes. The Lancashire Heeler has a complete set of evenly spaced, white teeth meeting in a scissors bite. Black in the black and tan dogs, and brown in the liver and tan dogs. The medium sized, almond shaped eyes are set well apart. They are dark in color except in the liver dogs, which may have lighter hazel colored eyes that matches the coat color. The ears are either fully or partially erect. Partially erect ears should show some lift. Drop ears that have no lift are undesirable. The neck is of moderate length, and set well into the shoulders. The shoulder blades are well back, and the upper arms set the elbows firmly against the ribs. The short forelegs are well boned. The pasterns allow the feet to turn out slightly but not so much as to cause weakness or interfere with correct free movement. The length of the body, measured from the top of the withers to the set-on of the tail, is approximately one inch greater than the height at the withers. The ribs are well sprung and extend well back in the body to a short loin. The topline is firm and level. The stifles are well turned, and the rear pasterns are short. From behind, the rear pasterns should be parallel whether standing or moving. Faults: Cow hocked or bandy hocked. Small and firm, with well padded toes. The natural tail is set on high and carried in a slight curve when the dog is alert. Fault: Tail carried in a complete ring. Dense and double, with a fine undercoat, and a hard, dense topcoat that is short and flat. The topcoat forms a slight mane on the neck. The undercoat should not show through the topcoat nor make the mane stand off the body. Faults: Long or excessively wavy coats are highly undesirable. Black and tan, or liver and tan, with pigment that coordinates with the color. There are rich tan spots on the cheeks and often above the eyes. Rich tan on the muzzle and cheeks, the chest, from the knees downward and inside the hind legs and under the tail. A distinct thumb mark, according to coat color, directly above the front feet is desirable. Note that richness of the tan color may fade with age. White is to be discouraged, though a small white spot on the forechest is permissible but not desirable. Ideal height at the shoulder is 12 inches for males, and 10 inches for females. Smart and brisk with free, natural movement.